What does the future look like for cryptocurrency? The fintech revolution is in full swing, with companies cropping up to assist with the possible transfer to a new way of conducting financial operations. Cryptocurrency has already commanded a huge audience and shown us ways in which we can use the underlying blockchain functionality to improve current systems. The cryptocurrency boom, bubble, and revolution have been referenced many times, but what could we actually expect from cryptocurrency moving into 2019, having seen its benefits and changes through the past few years? Some predict that the next few years will see a big change in crypto as institutional money enters the market. This means that those with the big enough investments to really take the revolution forward. 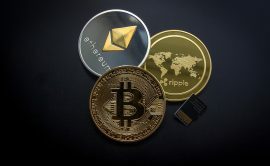 Indeed, the number of daily cryptocurrency interactions is up year on year, which shows growth, despite some citing the waning nature of investors wanting to get involved. Moreover, there is the possibility that crypto will be floated on the Nasdaq, which would further add credibility to blockchain and its uses as an alternative to current financial options. But some predict that all that crypto needs is a verified exchange traded fund (ETF). An ETF would definitely make it easier for people to invest in Bitcoin, but there still needs to be the demand to want to invest in crypto, which some say may not automatically be generated with a fund. Some also cite that in 2019 we’re going to see a shift in the leading force behind cryptocurrency. Granted, Bitcoin opened the vault and allowed the mainstream to understand the complexities of a cryptocurrency and of blockchain in general. Some say that Ethereum added to this and showed that there could be possibilities beyond the tokens. But most will argue that Ripple really showed the uses for blockchain, especially with its smart contracts that are being looked into by the likes of Santander and CIMB. Indeed, it seems that Ripple may even replace Swift payments for cross-border transactions, as has been touted in the cryptosphere for a while. Ripple may even attract more institutional investors not necessarily as a cryptocurrency, but as a formulation of blockchain in a practical environment. However, there are critics of cryptocurrency and its uses in the future. Some cite that the volatility of Bitcoin especially – a common criticism of blockchain, which appears short-sighted given the volatility of many other commodities, for instance, coffee – may render the coin boom worthless. Indeed, it is possible that Bitcoin may lose value as other alternatives gain value and take the market share that would have been reserved for Bitcoin. This possibility combines with the idea that cryptocurrency is just the start of what blockchain functionality offers and that Bitcoin as one example has less of a complex structure of blockchain and therefore may offer less in the future. Ripple, Ethereum and even Stellar Lumens are gaining popularity, which could relegate Bitcoin. An example elsewhere could be Kodak’s market share of standard film cameras compared to its slice of the move towards a digital market, which left Kodak behind. A stark warning for crypto is that there needs to be more than just its financial arm. As Ripple’s success as an “added value” crypto shows us, there needs to be something extra that the cryptocurrency can do that shows its viability to weather the storm of critics. As such, some predict that the future will see that blockchain and their uses will accelerate and be taken up by larger corporations as a way of testing the water. The principles behind blockchain have already been used in the music industry and in order to purchase unique digital pets, so once applied to other systems could be used in ticketing or anything that requires a unique identifier that requires a high amount of security and protection for both the user and the vendor. Cryptocurrency is an interest case study in that there is no precedent for what may happen to it. Some argue that it will follow the dot-com bubble, but others suggest that the internet is the greatest invention of the century. So despite some sites collapsing and being made redundant, the internet, on the whole, has improved lives and made things incredibly easier for many people. It also goes to show that cryptocurrency predictions have also come to nought before, so while in other spheres the predictions are more precursors to what might happen, in this industry they are rendered as jus that, predictions for what could happen. 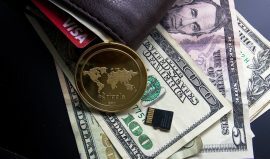 Cryptocurrency is still in its infancy in terms of credibility in the wider financial world, but the fact that so much attention is drawn to it can only be a positive step, especially for the underlying blockchain functionality. If you’re writing about something like this, you NEED to know that there’s a difference between Ripple (the company) and XRP (the cryptocurrency). Please change it! Otherwise, nice article. Funny these articles trying to predict the future of crypto. I can write them in one sentence. The value might go up or down or stay the same…. XRP holders will benefit. See you in 10 years when Ripple becomes the Google of exchange. Even XRP has its competitors, particularly Sys. Still anyone’s game as far as the future goes and realistically, it will only take off when Banks can get their slice of the pie. A blockchain-based payments system tested last week outdid traditional payment networks. Santander will launch DLT-based international payments for retail customers in Spain, Brazil, Poland and the UK. CIMB's product SpeedSend has corridor with Australia, US, UK and Hong Kong. The firm has already begun to receive payment instructions from two other network partners. Establishing the Malaysia-Spain blockchain channel. Features Binance down, a “Crypto Rich List”, and VMS Software and Swirlds. Famous duo ally as XRP is the first settlement mechanism.